Why would I choose a corner sink for my bathroom? They're both space saving and stylish. People chose to install a corner sink for either style or space. Being nestled in a corner offers some interesting design options: double shelving, adjacent mirror walls, corner medicine cabinets and so much more. Corner Pedestal Sinks do not have any storage compartments under the sink so what you do with space above your sink is extremely important. Some corner sinks offer special amenities like the attached towel bars on many Corner Glass Sinks or the self-draining soap dishes on the Mountain Pond Corner Sink White and Sheffield Deluxe Corner Sink White. Why would I not choose a corner sink? Corner sinks offer more space in any bathroom, they offer less space for bathroom storage. For some, this loss of storage is a great disadvantage. Unlike larger sinks with big counter spaces, smaller corner sinks are not designed to hold many bathroom accessories. However, some larger sizes are available, like the Glass Countertop Corner Fan Sink Clear or Corner Console Sinks. In choosing a corner sink, think carefully about your organization of bathroom essentials. 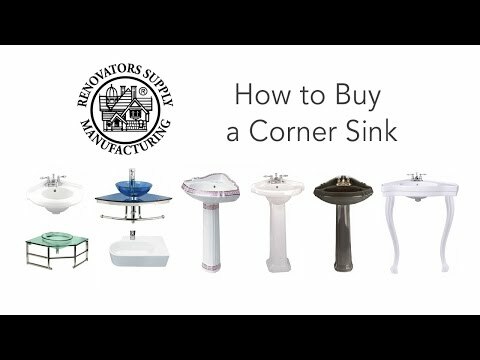 If you desire a particular faucet with a large footprint or long lever handles, that faucet style may not be compatible with a corner sink- especially corner sinks with a back splash. A back splash panel can interfere with opening a lever handle faucet to full flow. What are corner sinks made of? Corner sinks can be made of a variety of materials including stainless steel, glass & earthenware. Earthenware: Many experts recommend earthenware because it is durable, hard, and easy to clean. Grade A Vitreous China is the best earthenware material for a corner sink. Known for its extreme durability yet delicate gloss, it is found in many fine establishments worldwide. China can come in traditional white or other colors such as bone or black. Glass: Corner glass sinks should be made of tempered glass, for strength and safety. Some inexpensive glass sinks aren't even tempered or they have visible manufacturing defects, such as air bubbles in the glass. Glass sinks can be found in many colors. The glass vessels can be found in many colors, textures, shapes, and styles, such as etched or hand painted. Glass Vessel Sinks are versatile and can be used on almost any corner vanity with an appropriate countertop.